Enthused as I was by the Camping les Cascades, I returned there this weekend with all the family including my parents. Numbering six, we rented the super deluxe mobile home 'Titania 3' with three bedrooms and all new, clean and comfy. We were located diagonally opposite to where we had been the last time, and no campers ventured our way, so the inhouse entertainment was not so varied. This may have been a good thing as there was a group of happy campers who were there to have 'a good time' together, which means, of course, to have a piss-up. Our host was as charming as ever chatting about how he is putting the miniature village attached to the campsite up for sale on Ebay together with the antique farm implements. It's too much apparently being in the 'Accueil' of the campsite and trying to ensure people don't nick the santons and other bits from the village. He also told us that it is, sadly, his compatriots who are the worst at stealing from the mobile homes. Some people just seem to have an attitude that if they have paid to rent a place, they are entitled to take home souvenirs other than photos of their stay. Selfishness seems to know no bounds or pits. This time we made it down into the Concluses although most of the water had gone in the short time since Easter. It was a steep descent into the ravine which the boys enjoyed greatly, pretending they were on an expedition in the jungle forests with party leader and backup staff. The elder members of the party took an easier route along a pebbled path which gently meandered its way down to a bridge over the riverbed. The limestone rock has been carved into deep pools by swirling ages of water and sculptured into interesting forms over the eons of years of its existence, all vegetation scraped away by the rushing of the river. 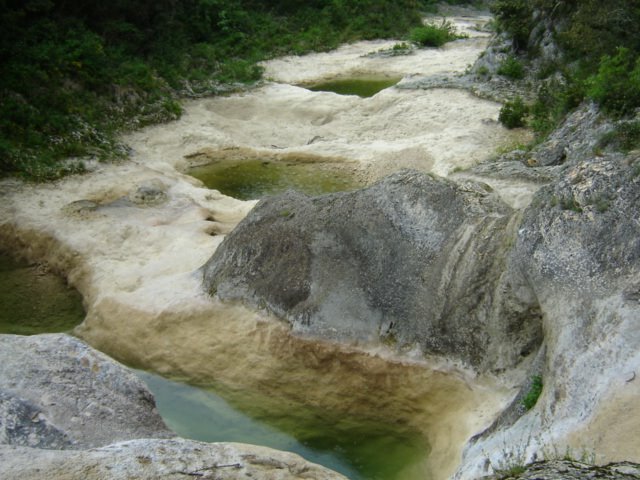 We made our way along towards what would be a waterfall in wetter seasons with a deep pool on the other side and a rock smoothed by the pounding of water landing on it which bore a remarkable resemblence to a pair of buttocks. We left the campsite after lunch, having seen the cascades again, and swum in the solar-heated pool. We headed towards Anduze and the Bambouseraie which is celebrating its 150th anniversary. 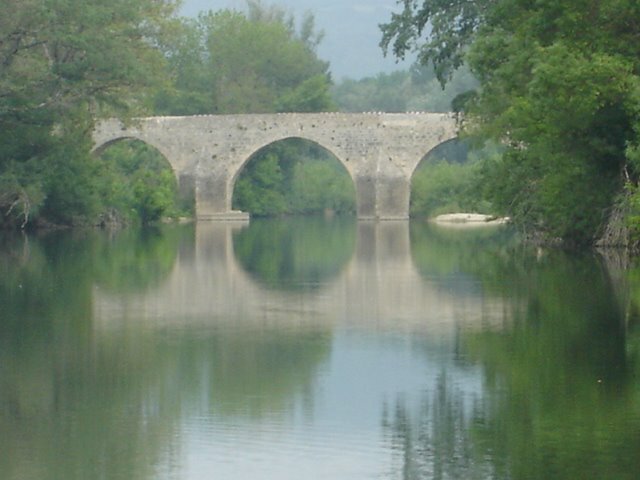 It is one of my favourite places in the region, and we normally visit it on a day trip taking in a ride on the little train from Anduze to St Jean du Gard and back again. This time, however, we had to drive there and fight our way into the carpark with what seemed to be most of the regional population both visitors and locals. It also started raining, but we stuck it out and the rain stopped to provide a suitably muggy atmosphere, just right for a trek into bamboo country. There were various additional attractions to celebrate the anniversary including an international bonsai competition by the School of Bonsai Art. 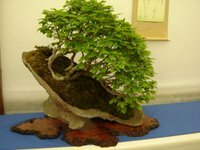 I have never seen such an impressive display of bonsai trees, which included mini forests, and trees set on a slope of rock and moss. 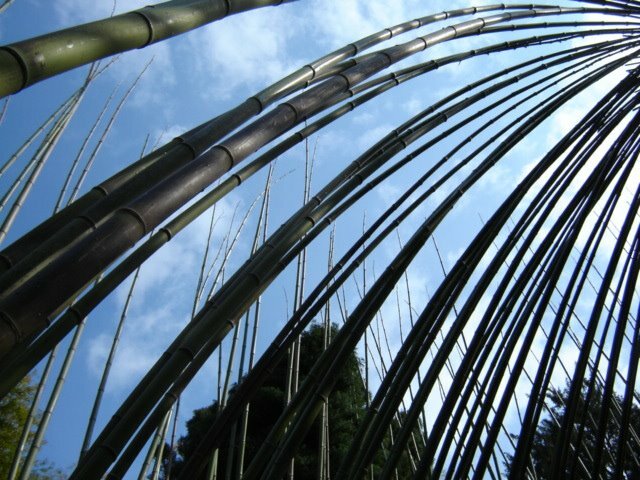 Another new feature is the Dragon Valley; a zen garden in the form of a dragon, and various works of art including a bamboo dome made with 150 bamboo trunks by Tieri Lancereau-Monthubert. The Bambouseraie is a fabulous place to visit, has a fantastic shop filled with delightful things made of bamboo including a tee-shirt so soft it feels like cotton wool. You can buy the perfume Bambou made by Weil, various implements for the kitchen, books, decorative items for the house and even bamboo flooring. 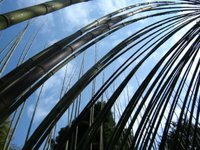 The garden centre offers several sizes and shades of bamboo and other plants including citrus fruit trees, pots and bamboo water features. My youngest declared he wants to live in the Bambouseraie, which, for a 5-yr old is some recommendation! Best seen, for boys, in conjunction with the steam train and picnic lunch for maximum fun. The trout, by the way, were fantastic, the asparagus to die for, and the strawberries pure delight. nice! is a zen garden the same as as a rock garden? Not exactly, it's a garden of peace using natural forms and trees, rocks, plants in specific places. This one was built in the year of the Dragon, and its form is that of a dragon. Water plays a central role, with islands and a waterfall, and bridge to observe the beauty of the whole. It was relatively peaceful despite the numbers of people walking round it. Just bumped into your blog about la Roque - I first went their with my family in the mid 70's, my father having indulged his teenage son to choose a site. We loved it and returned several times as a family and then I took friends in my own right in more recent years. The last time I went would be just after the present owner had taken it on, in late September 2001 I think. He was quite obviously wondering whether he had made the right move (from some unrelated job in Paris, from memory)but he had plenty of plans for the future. I am glad that it sounds as if he has been successful. I can recommend a walk up into la Roque itself, pausing at the rather pleasant cafe-bar half way up.